It’s been a year since Superman apparently disappeared, and the fine folks of Metropolis have moved on, though many take an evening to revisit the past, watching a retrospective on the life and times of their favorite son. Among the spectators are Lois Lane and Clark Kent, who discuss the authenticity of the retrospective with a couple different viewpoints. Shortly after, other familiar elements of the Superman story are reintroduced–Jimmy Olsen, Lex Luthor, Perry White. A familiar "villain" is introduced here as well–one that may be familiar to older readers, but I’m not sure this character has appeared in the Superman comics since the mid-80s reboot. As this villain is attended to, we as readers are clued into at least part of why Superman has been absent for a year. I wasn’t sure what to expect going into this issue. I’ve been concerned at the idea of "my" Superman–that is, the character (re)introduced in Byrne‘s Man of Steel mini-series–being shuffled off to the side in favor of yet another/different reimagining of the character. While this is only the first of an 8-parter that re-establishes the character post-Infinite Crisis, the writing team of Busiek & Johns has assuaged some of my concerns as several aspects that have defined the character and supporting cast for the last 18+ years are re-established here. However, there seem to be a number of minor or subtle shifts that distance things from the past, settling the characters very much in a sort of "timeless" present. 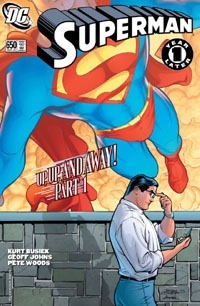 Busiek wrote my favorite Superman story in 2004’s Superman: Secret Identity. Johns on the other hand has written some other very compelling stories that I have really enjoyed over the past several years (including pulling me into following The Flash for 30 issues after never previously caring for the character). That said, both writers have a lot to live up to in my eyes, and for the moment, I’ll cautiously advance the idea that yes, they have lived up to those high standards. The writing here is clear and definitely gets across the idea first of the broad strokes of Superman’s history that just about anyone will be vaguely familiar with (whether you know the character solely from last month’s issues, the Christopher Reeve films, Smallville, Lois & Clark, a parent/grand-parent’s stack of older comics, or just picking up on elements from years of the character’s suffusion of popular culture. If this is the first-ever comic starring Superman that you’ve read, you’ve got yourself a good starting point. If you’ve been following these comics for 20 years, you’ve got a good read that revalidates the character for the present, showing that both the old and newer elements can come together in a single well-written manner that gives us a story of Superman. Offhand, I am unfamiliar with Pete Woods‘ art, but this issue makes for a good introduction. Everything seems nice and clear/clean–reading along with the story, the art shows exactly what is going on and pretty much just does it’s job of enhancing the written word to contribute to the overall look and feel of the issue. The art’s not perfect–but very little is. The main quibble I have is the depiction of the S-shield; it comes across a bit too "shiney" or metallic for my own tastes. However–whether in Woods‘ art itself or the coloring (or both)–this issue somehow has a "brighter" feel to it than a lot of recent DC issues–by design or not, this lends itself to this being an upbeat, bright start to a new "generation" of Superman. I very much recommend this issue, whether you are a new, old, or an on-the-fence reader.